Millennial Generation lawyers are the future of the law profession, and current leadership needs to know how they think and how to develop them into effective leaders. The emphasis is on respect, civility, honorable behavior, reaching out helping hands to communities and those less fortunate … and more. Those themes — very much in the national conversation today — are driven home by stories from a day when the underlying values were paramount in law practice. The hope is that they will become part of our own experiences today. Regales readers with inspirational stories of lawyers from a generation past to demonstrate a healthier path forward for a profession in transition. 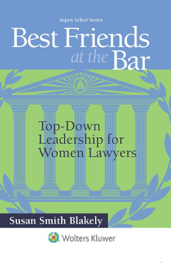 With a Foreword and in-book endorsements by leading lawyers at some of the world’s most prestigious law firms, this book has been recognized as a game-changer for the legal profession. The message is that bad habits and toxic environments are not beyond repair if we listen to the voices of a new generation of lawyers and help them — and us — find a better way forward. Available soon on Amazon. Get it and read it NOW! I know that I am coming in a little late to alert you to Women’s Equality Day. It was celebrated YESTERDAY, August 26th, but I have a good excuse for missing it by a day. Yesterday, August 26th, would have been my Mom’s 103rd birthday. She died in 2017 at 101 years young, and I was absorbed yesterday with thoughts of her. As excuses go, I think it is a good one. My Mom would have loved Women’s Equality Day. She graduated from college in 1937 when most women did not go to college. She worked hard to support herself as a teacher before she married my Dad, she was devoted to improving her community through volunteer service, and, up until the last days of her life, she was asking how she could “help out” at the assisted living facility she called home. Whether it was folding towels or showing up for Bingo just to be a good sport and raise spirits, she did it all. Today, women have come a long way beyond the kinds of opportunities available to my Mom and her contemporaries. We are lawyers, doctors, bankers, board members, business executives, and government and elected officials, to name just a few. We have learned to use our voices and have our voices heard. As someone once sang, we bring home the bacon, and we fry it up in a pan! But we still have a long way to go for total equality. Keep at it. Make sure YOUR voice is heard. Do not settle. Great song. Frankie Valli & The Four Seasons. For those of you who did not — shame on you—catch Jersey Boys on stage, there is always YouTube to get the flavor of great music of bygone years. As some of you may remember, August and December are the times when I step back from blogging to focus on family. 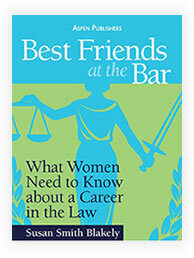 So, you won’t be reading my blogs again until September — when I will return to help move the needle forward for women in law. However, when I see a tidbit that you need to focus on between now and then, I will make sure you can find it on the Best Friends at the Bar Facebook page. But it will not be all fun and games for me this August. 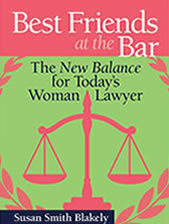 I will be spending a lot of time promoting and marketing my new book for ALL young lawyers. 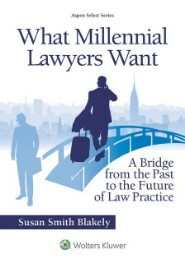 What Millennial Lawyers Want: A Bridge from the Past to the Future of Law Practice (Wolters Kluwer/Aspen Publishers) goes to print next week and will be released on September 1st. I am very excited about the possibilities of this new book, so please watch for it. It is a quick read and one that I know will interest the young lawyers in my orbit — and hopefully the seasoned lawyers who reside where change begins. Best wishes to all of you for end of summer bliss. Take time off for yourself and friends and family while work is slow. Remember the importance of balance.